Famous for her love of jewelery, Renata Litvinova will soon put on sale her special accessories - jade rings, necklaces and bracelets that bring happiness. The actress and director Renata Litvinova is the first Russian celebrity, representing Carrera y Carrera as the Ambassador on the territory of Russia. Manuel Carrera said about her: "This is the diva with a bright character as jewelry Carrera y Carrera». It is not surprising, because Renata is an actress, understanding design and charisma of jewellery and she is able to wear them. "For the first time I appeared in jewelry Carrera y Carrera at the Moscow Film Festival, - says Renata. - I chose brooch from Bestiario collection in the form of a crocodile's head - this is a bold image that captivated me by youthful audacity of designers. " Now Renata is ready to present her own collection of jewellery. "Jades are bringing me more happiness then precious gold. Emerald "eyes" are inserted into necklaces and bracelets as a protection from the evil eye. - Renata wrote on Instagram, posting a photo of jewellery. Jewelry line - a kind of debut for Litvinova, because earlier only her paintings and T-shirts can be purchased on her website. 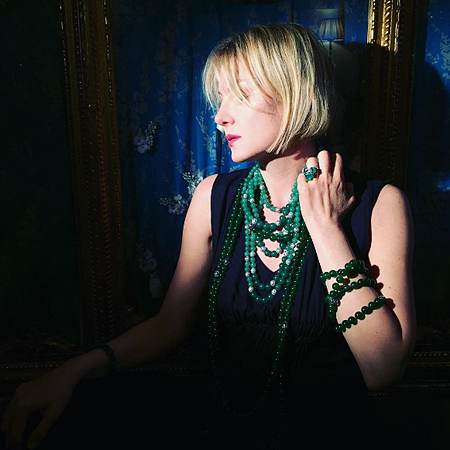 Renata Litvinova in jewelry with jade by Renata Litvinova The collection will be available soon on the website RenatalitvinovaStore.